IT'S [Talk] TUESDAY; The Improviser's Guide Podcast | Listen Free on Castbox. Hosted by the creator of the honored ensemble [By The Mummers], Frank Cardillo. In an interview conducted the week of March 11th for Theme Park Thursday with @DillosDiz, A. Ali Flores discusses his 20+ year career as one of the most recognized Central Florida entertainers. Ali's passion for standup comedy began when he started doing audience warm-up for shows like Double Dare 2000, NBA All-Star Jam, Ripley's Believe it or Not, Fox Family's Summer Jam and, most recently, Family Feud with Steve Harvey. . His uniquely energetic show will have you laughing from start to finish. His instantly likable personality and his comedic routine is relatable to everyone. From subjects of race to sports to being a single dad he turns your real life (or rather his and those he comes in contact with) into side splitting, sometimes embarrassing, humor! You may have seen him in the ABC Family movie “My Future Boyfriend” or any of his many commercials. He just completed shooting the film “Random Tropical Paradise” starring Joe Pantoliano, Bryan Greenberg and Brooks Wheelan, the film “Naked” starring Marlon Wayans and an episode of “Good Behavior” set to air this fall on TNT. Author Brian Depetris joins IT'S [Talk] TUESDAY: The Improviser's Guide Podcast to discuss his first published children's book, 'The Dreamland Express'. Theme composed by Matt Harvey. Intro composed by Lindsay Zaroogian. LIKE The Improviser's Guide on Facebook! FOLLOW @FrankMCardillo on Twitter. TheImprovisersGuide.com for more! Jim Greene's Scarlett Rat Entertainment produces Dickens Christmas in Skaneateles, outside Syracuse NY, between Thanksgiving and Christmas Eve each year. Interactive character extraordinaire John Michael Decker plays Scrooge and is this episode's guest on IT'S [Talk] TUESDAY; The Improviser's Guide Podcast. We discuss the very, many, un-merry Scrooges, comic book storytelling, and the art of being approachable. Theme composed by Matt Harvey. Intro performed by Lindsay Zaroogian. LIKE The Improviser's Guide on Facebook! FOLLOW @FrankMCardillo on Twitter. TheImprovisersGuide.com for more! The title character of this November's Hamlet Isn't Dead production of 'Julius Caesar' joins IT'S [Talk] TUESDAY; The Improviser's Guide Podcast. Maureen Fenninger discusses power, gender, and the jaw dropping revelation that she has yet to watch a single episode of 'Slings & Arrows' (no judgment). Theme composed by Matt Harvey. LIKE The Improviser's Guide Network on Facebook. FOLLOW The Improviser's Guide Network on Twitter. TheImprovisersGuide.com for more. This week's edition of IT'S [Talk] TUESDAY; The Improviser's Guide Podcast tackles the debate of 'TRUST' vs. 'FAITH'. Are these two words interchangeable? Should they be treated separately? Is evidence required? A lofty discussion. Dr. Rus D. Jeffrey has close to 40 years of mainstream broadcast experience and 20 plus years of pastoral ministry experience. In 2002 he and his wife Sandra founded Fresh-Wind Ministries. What started as a church plant has now transformed into a growing network of churches as they serve as oversight for ministries flowing in the Apostolic-Prophetic Movement. Originally from Belleville, Ontario, Canada, Dr. Rus and his family also spent approximately 25 years in the United States working in both ministry and radio broadcasting. Theme composed by Matt Harvey. Intro performed by Lindsay Zaroogian. LIKE The Improviser's Guide on Facebook! FOLLOW on Twitter! TheImprovisersGuide.com for more! Solo Improviser Peter Michael Marino returns to IT'S [Talk] TUESDAY; The Improviser's Guide Podcast to discuss his latest offering, 'Show Up, Kids'. We discuss children show experiences, King Kong, the endless hustle, & the flu shot. Theme composed by Matt Harvey. Intro performed by Lindsay Zaroogian. 'Sugar Honey' by Lady D & The Shadow Spirits. LIKE The Improviser's Guide Network on Facebook. FOLLOW The Improviser's Guide Network on Twitter. TheImprovisersGuide.com for more! This week's IT'S [Talk] TUESDAY guest is Alyssa Duerksen. Lady D & the Shadow Spirits have just released their new album, 'Star Kiss', and Alyssa is here to discuss the real, the authentic, and the truthful journey of this collection. Lady D & the Shadow Spirits plays deeply powerful soulful poetry through the lens of rock, folk, soul and punk music. Lady D, Alyssa Duerksen, fronts this powerhouse band of refined Ithaca musicians, Justin Roeland, Mike Amadeo, Chris Ploss and Jason Shegogue. Their sound is unclassifiable in a sense, they traverse flawlessly between intimacy and expansiveness, and somewhere in the middle there is actual magic. Lady D's haunting voice bathes the crowd with something like a prayer and a primal cry; her prayer is for all of life, her cry is for peace and music happens to be her favorite language. Theme composed by Matt Harvey. Opening interlude performed by Lindsay Zaroogian. LIKE The Improviser's Guide Network on Facebook. 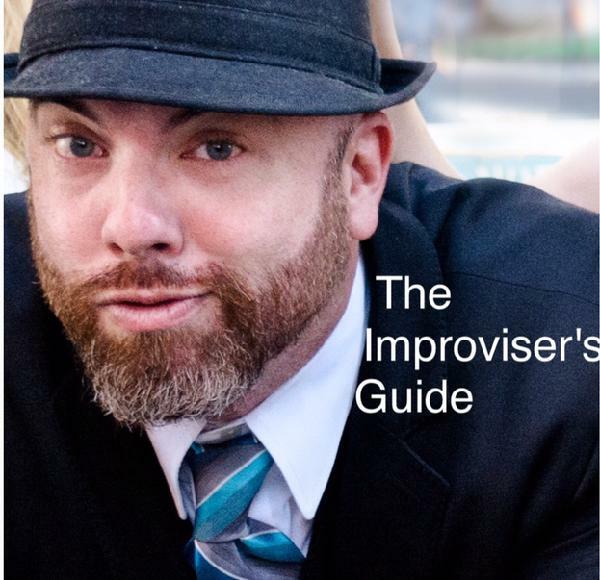 FOLLOW The Improviser's Guide Network on Twitter. TheImprovisersGuide.com for more!